Loved ur receipe n the simplicity of it. They were delicious!!! So glad you enjoyed the tortillas, Diana! My nana used to make sweet flour tortillas but I dont remember the recipe. I looked online but they are either really chubby gorditas, or they add things like vanilla, sweet condensed milk, cinnamon and they look nothing like the ones we had. Can you help me find a recipe? I believe they were from northern Mexico and had butter, lard, milk and sugar but I don’t know the measurements. Oh, yes, I know what you are talking about, Angie…like gorditas de nata. I don’t have a recipe for those yet, but I will try to test one soon. 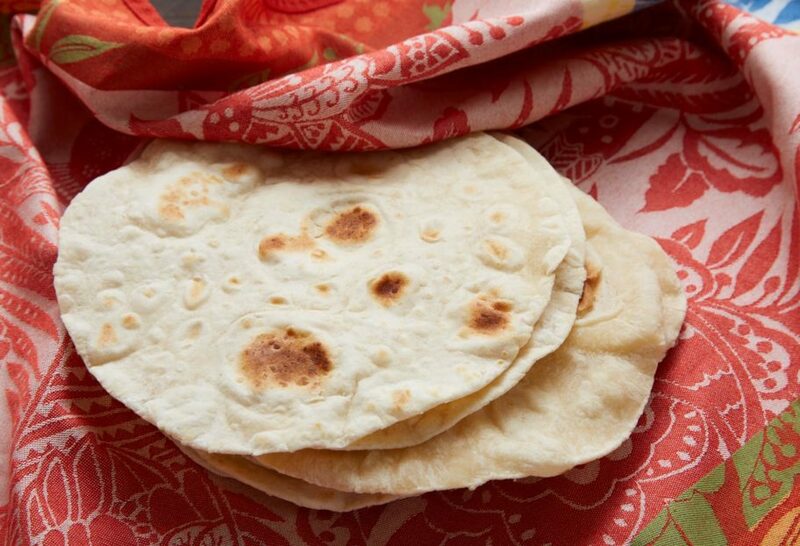 My mom used to make flour tortillas for our family of 9 almost every day! If there were leftovers, we would make a tortilla with peanut butter and jelly! So good! She used to put baking powder though. I made some a few weeks ago and used baking powder and they were hard and crumbly. I made yours today and they were soft and pliable! They are really good and my family loved making breakfast tacos with them. I reduced the recipe to half since we are a family of three. We had three left over tortillas and I made my family the peanut butter and jelly taco! I was immediately transformed to my childhood! Thank you do much for sharing your recipe! I watch your show religiously and enjoy it immensly! Oh I’m so happy the tortillas brought back such a fun and yum memory, Yvette! Thank you for sharing your PB and J taco story with me. Hi Pati, I love your shows. My children and I watch you all the time. You inspire me. I’m going to try the recipe but I wanted to ask if and what would you suggest to substitute the lard/veg. shortening with if I wanted to make them more healthier. Thank you guys for tuning in, Veronica! The alternative for lard here is butter… and you can also try it with other oils and fats like coconut oil and see how you like it. You can try them with a bit more fat and water, Lisa. I hope you give them another go! I just watched your show for the first time and I loved it. I’m so excited to make homemade tortillas and my husband is too! He is especially interested in the salsa recipe. I’m so glad you found me, Martha! Have lots of fun cooking the tortillas. Making some flour tortillas right now. I use unbleached flour for every recipe. I use baking powder, because my mom did, otherwise I use the following you use. I am heating up my beans, resting the tortilla dough. Waiting patiently to come together. Simple evening dinner. I have to shop tomorrow for groceries. Yum. I hope to make corn tortillas next, I have corn meal, I have fine corn flour, I’ll look for your recipe. Hi Pati. I love your show! You’ve inspired me, I love your enchilada sauce recipe, my family loved it! My son Sy and I are working on flour tortillas (1st time) the first was too thick, 2nd better & 3rd much better, but they have a strong floury taste, did I use too much flour? Hm, my guess is you needed to knead the dough a little longer so it transforms and maybe, cook them over lower heat but a bit longer as well. I just made these for the very first time today. The taste was wonderful. I think maybe I need to work on the cooking part though, they didn’t seem to be as pliable and I would have liked. Thanks for the recipe. I will keep at it until I get it rights. Tortillas can take some practice…keep going, Randy! Hola Gina! Uy en diferentes lugares pero muchas cazuelas son Le Creuset y muchos platos son de un pueblo llamado Tlaquepaque. Are you using all-purpose flour or self rising flour, Thanks, my first time trying Tortillas, used store bought before. I use all-purpose flour. Have fun making your first tortillas, Yeede! My husband and I, truly love your show! I come from first generation of Mexican descent and many of your recipes are inspiring and nostalgic. I love how you’ve created or intertwined both the American type foods with traditional ingredients and combine such classic recipes into awesome Mexican food that is simple and most delicious. Thank you so much for sharing your knowledge and inspiring us to cook and create wonderful meals for our families. I have a question, I’ve been making flour tortillas since I was 8 years old and my measurements come from what is learned not measured, haha, however, in your segment on making flour tortillas, your ingredients didn’t list baking powder for leavening the dough? Is it an important ingredient or it really doesn’t matter. Oh thank you for your lovely message, Sylvia! No need for baking powder…enjoy the tortillas. Can you make this on a griddle? If so, what temperature should I set it on? Sure! Heat your griddle to a low heat, Eric. It is always a special treat when I make flour tortillas. I would like to make them in advance for the Christmas Holidays. When is a good time to put them in the freezer? Rolled out, right before I cook them? You can freeze them made…just wrap them really well, and then reheat them on a hot comal or skillet. Have a Merry Christmas, Laura! Using a recipie for flour tortillas but slightly modified (not sure how) my mom would make Empanadas filled with gound beef,raisins and chili seasoning. That she slightly fried, not baked, on each side until golden. Soo yummy! Do you know a recipie for these empanadas? Or what modification she made so the dough was soft not crisp. Thank you Pati for cooking with manteca. It’s just the best. I am Cuban and we cooked everything with Manteca. So delish. Even the Cuban crackers. No substitute for this glorious taste. It’s soooo good…glad it brings back good memories for you Ana. Your other recipe for ‘Homemade Flour Tortillas’ calls for 1/2 cup lard while this recipe (and your video) calls for 2/3 cup lard. (Both recipes call for the same amount of flour.) So, 1/2 cup or 2/3 cup lard? It’s 2/3 cups of lard. Thanks for catching that Dana! Thank you so much for this recipe and video! Can’t wait to try them? Do you have any advice on storing them? Do they keep in the fridge or freeze well? Thank YOU for trying the recipe, Jennifer. As soon as you make them, place them in a tortilla warmer or clean kitchen towel. If you will not eat them within the hour, wrap them in a plastic bag and refrigerate, and then reheat them on a hot comal or skillet. And yes you can freeze them…just wrap them really well. Thank you, I got my first smart phone and I found you.finely. Glad you found me, Theresa! Don’t you have to add baking powder to this recipe? And about how much? Part, I love your show!im looking for a very old fashion recipe for Mexican hot chocolate, I know there’s some kind of peppers and other ingredients but I can’t find the recipe for it, help would like it for the holidays, thank you so much! Hmm this isn’t an ancient recipe but here you go, Patricia: https://patijinich.com/recipe/ancient_ways_for_comfort_in_cold_days_mexican_hot_chocolate/ And you can add ground chipotle, ancho or guajillo chiles to it.